With offices in Texas, Louisiana, California, Pennsylvania, Alaska, Calgary, Perth, and Aberdeen, Cenergy provides inspection services efficiently, economically and globally. 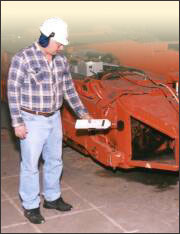 Every workplace where hearing protection is worn, requires a "noise survey" to be done when new equipment is installed or there are suspected changes to noise levels. It is prudent to have a noise survey done annually in order to properly monitor noise levels. Noise surveys must be in compliant with ANSI Standard S1.25-1991, CSA Standard Z107.56-94 and OSHA G7.2 exposure limits.